Still dunno what to do this Valentine's Day? No idea as to how to you'll surprise your love one? Well, here's a simple treat that you and your love one will enjoy. And I'm sure that with their delectable dishes and heavenly accommodation, you'll feel relaxed and in love this lovely day. An Affair to Remember is the Valentine's Day treat of Eurotel Hotel to its faithful and lovely guests during this Love Month. Couples can enjoy a dinner date for two with room accommodation to make this lovely day more meaningful and more romantic. There are sets to choose from for this Valentine's Day treat. Set 1 is composed of room accommodation, set dinner for 2, wine fore 2, chocolates, flowers and acoustic accompaniment that will make you night really lovely and worth remembering. This set cost only Php2500.00. Aint that bad, eh? But if you are on a short budget this V-day, don't worry because Set 2 offers a lovely set dinner for 2, wine for 2, chocolates, flowers and acoustic accompaniment too that will take you both to love paradise. There'll be no room accommodation on this one, so it'll just cost you Php1500.00. This Valentine's Day treat is on limited slots only and it varies on the branch. 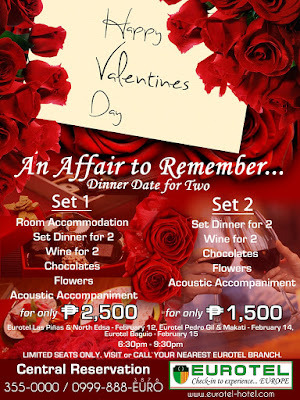 Today, Valentine's Day, Eurotel Pedro Gil and Makati offers this Valentine's Day treat. And tomorrow, February 15, Eurotel Baguio open its doors for this treat. The Dinner Date for Two is available only from 6:30 p.m. til 9:30 pm. So if you wanna make a reservation, you may call (02) 355-0000 or 0999-888EURO (888-376). Feel and enjoy the season of love with this Valentine's treat from one of the most respected and in-demand hotel in the country now, Eurotel! There's nothing more lovelier that feeling the love with a touch of Europe, right?